In the U.S. in 2016, we had a number of major disasters, natural disasters, and emergency situations come up as a nation. According to FEMA, we’ve had everything from severe storms & flooding, to hurricanes, to tornadoes, to landslides/mudslides, to winter storms and blizzards. 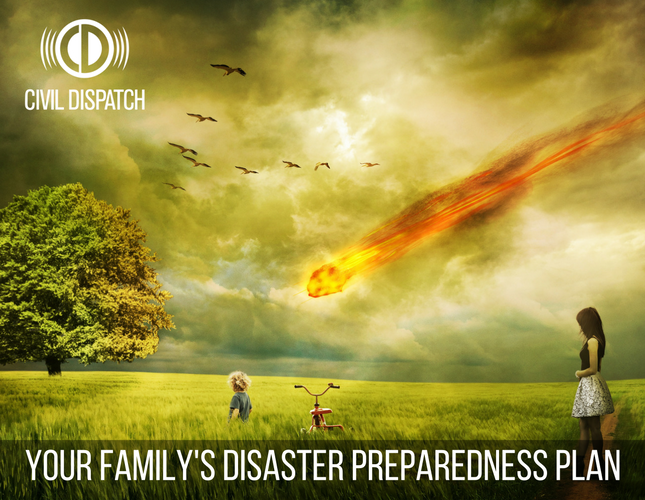 So how can you prepare for these emergencies and keep your family safe? Today’s society seems to rely so much on others rescuing them. But in an emergency, it pays to be self-reliant and prepared. Planning ahead can mean the difference between your family being together - or separated; confident - or frightened; alive - or dead. And to begin, you must start with a plan. This plan can be thought of as a map that will help you and your family navigate through these catastrophes and emergencies, knowing what to expect from each other, knowing how to perform and react, and knowing how to get by. In any devastating event, your main enemies are chaos and confusion. For your family plan, decide what to do before the disaster is imminent. Discuss the most likely threats for your area of the country and the landscape you live in. Once any of these occur (and they can sometimes set off others in the list! ), it’s too late to plan. You are now in reaction mode, and that is NOT a good thing. When you involve your children (and especially when they’re given age-appropriate jobs), they will feel much more comfortable in that emergency because they are prepared and know what to expect. Creating practice drills can also help children get involved, but to think and to be focused and calm during the emergency scenario. As a family, discuss your emergency meeting places, contacts, and plans. Give your children the opportunity to express their feelings and to ask questions so they fully understand the plan you are implementing. How will we get in contact with each other? What is my personal “emergency job?” What is everyone else’s? Normally, a binder is recommended with all of your checklists, instructions, emergency contacts, plans, etc. Everyone in the family should know where this binder can be found and one person should be tasked with making sure it comes with the family in an emergency. If there is a way to back this information up online, that is also a good option. Two things that can often get overlooked? One good thing that often gets left out of family plans is a current photo of each of the family members (and any pets!) so you can describe them accurately to search personnel, if you become separated. If any of your family members have special needs / medications, those need to be included in your plan also. Lots of homework from today’s post...Get your plan in place! And if you’re interested in signing up for a family plan through CivilDispatch.com, please check it out!